Begin your Alaska adventure with an overnight in Alaska's largest city, Anchorage. The next day, experience luxury rail travel as you journey from Anchorage to Fairbanks. With a night at the Mt. McKinley Princess Wilderness Lodge, and a night at Denali National Park, there’s ample time to experience the abundant wildlife and to visit viewpoints for the "Great One". Complete your Alaska tour with an overnight in the frontier city of Fairbanks. Travel aboard Alaska Railroad's Adventure Class railcar with picture windows from Denali to Fairbanks. Upgrade available for purchase. We'll pick you up at the airport and transfer you to your Anchorage hotel. Purchase an optional excursion or simply relax this afternoon in Anchorage. Overnight Anchorage hotel. 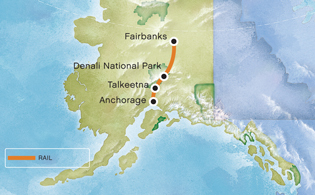 You'll continue your journey to Denali on our domed railcars. This afternoon, you'll arrive at Denali National Park. Visit the tour desk for information on optional activities available in the Denali area. Overnight Denali-area hotel. Grab breakfast at the hotel and explore the city before we transfer you to the airport for your flight home.